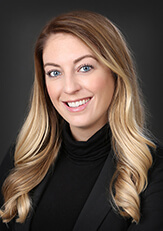 Nicole Flaherty is an Associate in FMJ’s Trusts & Estates practice group. She handles a variety of estate planning, business succession planning, and estate and trust administration matters. She understands that trust and communication are critical in a client relationship, particularly in the intricate areas of estate planning. As a younger estate planning professional in a growing practice group, Nicole has the resources to solve complex problems, the enthusiasm to design an effective plan, and the youthfulness to participate in the execution of the plan to successfully transition goals from one generation to another. Prior to joining FMJ, Nicole was an attorney at an estate planning firm in St. Paul. She received her juris doctor from the University of St. Thomas School of Law and, while pursuing her degree, gained legal experience in Dakota County as a student attorney juvenile public defender and in Minneapolis as a clerk at the U.S. Attorney offices and a judicial extern in Probate Court. Nicole likes to spend time with her family in Lakeville or at their cabin in Northern Minnesota. In addition, she enjoys playing golf and participating in various workout classes. When she isn’t being active, she cheers on her fiancé at his professional soccer games, her nieces and nephews at various youth sporting events, and the Minnesota Vikings and Wild.